Poor Millie. A small dinosaur with a long feathery tail, she has no means of protecting herself from big, bad Reggie. Each of her friends has something special to make them feel brave, but not Millie. She doesn’t think she’ll ever find her something special, until she comes across Reggie late at night. 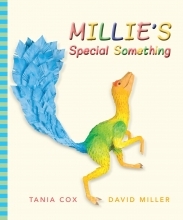 Millie’s Special Something is a delightful tale about unique talents, bravery and friendship. Tania Cox’s text is beautifully depicted by the stunning paper sculpture illustrations for which David Miller is renowned. It will truly be an exhibition not to be missed.